How do pathogens attack their hosts, and how do hosts defend themselves against these attacks? We are using the nematode C. elegans to study these questions of host/pathogen interactions in the intestine. The nematode C. elegans provides a wonderful system in which to study these questions. The worm has intestinal cells that are similar in structure to human intestinal cells, but C. elegans is transparent and easy to study in lab. C. elegans lacks a professional immune system, and instead relies solely on epithelial defense to fight off pathogen attack. It is being increasingly appreciated that epithelial cells in the intestine are involved in detecting and responding to pathogens in mammals, and are implicated in inflammatory disorders. It is critical to understand more about how these cells detect and respond to pathogens. What we find in C. elegans intestinal immunity may be directly applicable to host/pathogen interactions in the human intestine. 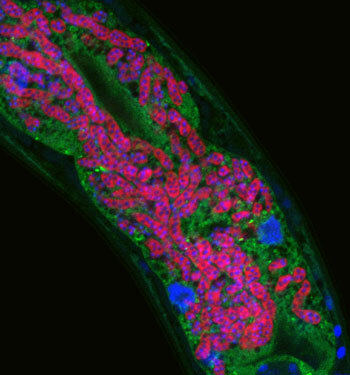 Microsporidia infecting C. elegans intestine – microsporidia are labeled in red, C. elegans intestine labeled in green, and DNA labeled in blue. Our research focuses on two different pathogens. The first pathogen is a natural intracellular pathogen isolated from a wild-caught C. elegans strain, which we have found defines a genus and species of microsporidia (intestinal infection of C. elegans intestine shown below). Microsporidia are poorly understood eukaryotic pathogens that are emerging pathogens of humans and can cause problems for immunocompromised patients. The second pathogen is an extracellular bacterial pathogen called Pseudomonas aeruginosa, which is a clinically relevant pathogen that causes opportunistic infections in humans. Intracellular pathogen response pathway promotes proteostasis in C. elegans. Reddy, KC Dror T, Panek J, Chen K, Lim, ES, Wang, D, Troemel, ER bioRxiv 2017. In vivo mapping of tissue- and subcellular-specific proteomes in Caenorhabditis elegans. Reinke AW, Mak R, Troemel ER, Bennett EJ. Sci Adv. 2017 May 10;3(5):e1602426. doi: 10.1126/sciadv.1602426. eCollection 2017 May. Identification of microsporidia host-exposed proteins reveals a repertoire of rapidly evolving proteins. Reinke AW*, Balla, KM, Bennett EJ, Troemel ER. Nature Communications, 2017 Jan 9;8:14023. doi: 10.1038/ncomms14023. *corresponding author. A Large Collection of Novel Nematode-Infecting Microsporidia and Their Diverse Interactions with Caenorhabditis elegans and Other Related Nematodes. Zhang G, Sachse M, Prevost MC, Luallen RJ, Troemel ER, Félix MA. PLoS Pathog. 2016 Dec 12;12(12):e1006093. doi: 10.1371/journal.ppat.1006093. Emily Troemel received her B.S. from the University of Wisconsin-Madison and then spent a year in Japan before receiving her Ph.D. in Cell Biology at UC-San Francisco. She worked for a start-up biotech company in the Bay Area before returning to academia to do a postdoc at Massachusetts General Hospital and then joined the UCSD faculty in 2008. Since joining UCSD, she has received a Searle Scholars Award, David & Lucile Packard Foundation Award and a Burroughs Wellcome Fund Investigators in the Pathogenesis of Infectious Disease Award.